"Adorable marshmallow Peeps® nestle atop a generous layer of chocolate chips and get baked into melty, gooey goodness. Scoop it up with graham crackers for a party-worthy s'mores dip. You can easily change out the Peeps® to suit any holiday theme." Preheat oven to 350 degrees F (175 degrees C). Butter an 8-inch oven-safe skillet. 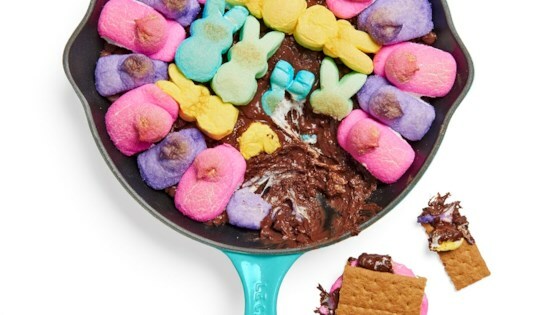 Pour chocolate chips into the prepared skillet and top with as many marshmallow chicks and bunnies as needed to completely cover the chocolate. Bake in the preheated oven just until chocolate melts and marshmallow chicks and bunnies are puffed and lightly toasted, 5 to 10 minutes. Serve graham crackers on the side to dip. Milk chocolate chips can be used in place of the semisweet, if desired.